The history of capacitors starts in the pioneering days of electricity. I liken it to the pioneering days of aviation when you made your own planes out of wood and canvas and struggled to leap into the air, not understanding enough about aerodynamics to know how to stay there. Electricity had a similar period. At the time of the discovery of the capacitor our understanding was so primitive that electricity was thought to be a fluid and that it came in two forms, vitreous electricity and resinous electricity. As you’ll see below, it was during the capacitor’s early years that all this changed. The history starts in 1745. At the time, one way of generating electricity was to use a friction machine. This consisted of a glass globe rotated at a few hundred RPM while you stroked it with the palms of your hands. This generated electricity on the glass which could then be discharged. Today we call the effect taking place the triboelectric effect, which you can see demonstrated here powering an LCD screen. Beginning in 1827, [Michael Faraday] began giving a series of public lectures at Christmas on various subjects. The “Christmas Lectures” continued for 19 years and became wildly popular with upper-class Londoners. [Bill Hammack], aka [The Engineer Guy], has taken on the task of presenting [Faraday]’s famous 1848 “The Chemical History of a Candle” lecture in a five-part video series that is a real treat. We’ve only gotten through the first episode so far, but we really enjoyed it. The well-produced lectures are crisply delivered and filled with simple demonstrations that drive the main points home. [Bill] delivers more or less the original text of the lecture; some terminology gets an update, but by and large the Victorian flavor of the original material really comes through. Recognizing that this might not be everyone’s cup of tea, [Bill] and his colleagues provide alternate versions with a modern commentary audio track, as well as companion books with educational guides and student worksheets. This is a great resource for teachers, parents, and anyone looking to explore multiple scientific disciplines in a clear, approachable way. If there were an award for the greatest scientist of all time, the short list would include [Faraday]. His discoveries and inventions in the fields of electricity, magnetism, chemistry, and physics spanned the first half of the 19th century and laid the foundation for the great advances that were to follow. That he could look into a simple candle flame and see so much is a testament to his genius, and that 150 years later we get to experience a little of what those lectures must have been like is a testament to [Bill Hammack]’s skill as an educator and a scientist. [Gadre] built his own ATtiny project without using any batteries. It’s an electronic Dice (or die if you’re being critical) which uses induction to charge a storage capacitor to act as the power source. 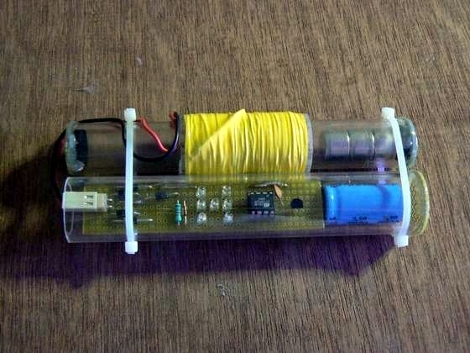 The voltage generator is made from a tube of Perspex which houses a set of rare-earth magnets. At the enter of the tube [Gadre] machined a channel wich accepts about 1500 windings of 30 AWG magnet wire. When someone shakes the tube back and forth the magnet passes the wire, inducing a current. The product is stored in a 4700 uF capacitor, which feeds a boost converter to power the rest of the circuit. The ATtiny13V that controls the circuit is running its internal RC oscillator at 128 kHz, the lowest setting possible in order to minimize power consumption. After a good shake the user can press a button to roll the die, which is then displayed for several seconds on a group of seven LEDs. See for yourself in the video after the break. Have you ever wondered how they inspect high voltage cables without taking them out of service? Check out this video which offers a glimpse into the life of a professional high voltage cable inspector. There are parts of the job you’d expect—namely perching on the cable like a bird, trying to not fall off—but the part of the job you wouldn’t expect is the suit. This suit is made of 75% Nomex, to prevent it from catching fire, and 25% stainless steel thread, turning the suit into a wearable Faraday cage. Of course, because he’s got a Faraday cage mere millimeters from his skin, the cable inspector spends his workday surrounded by half a million volts. To avoid electric shock, he equalizes the voltage potential between himself and the line before touching the cable. Depending on your specific phobias, this video might make your job seem really dull… or really really safe.